President Maithripala Sirisena says though he is fully prepared to ban the sale of liquor and cancel liquor licenses as the President of the country, but the challenge faced by the entire world is whether drugs, that has become a major social force could be banned outright. He pointed out that every country, from the strongest countries with highest development, everybody in the human society is faced with the challenge of drugs. “Though we can’t totally alleviate the drug menace from society, everybody should get together to save the society from drugs,” the President said. He made these remarks at the “Mathin Nidahas Ratak (A Drug Free Country)” third National Program concluded at St Joseph Girls’ College in Kegalle yesterday (Nov. 16). “I am not ready to give any relief to anybody engaged in illegal drug activities, concerning of their designations or my personal acquaintances with them. It’s the government’s policy to give severe punishment to them”, the President further stated. “The government’s attention has been paid on the strict control the sale of drugs near schools, temples and towns”, he said. “Though the government implement laws to raid and prevent drugs, it is a social responsibility to minimize the use of drugs. Everybody including Maha Sangha, other religious leaders and social activists should get together in that regard”, the President pointed out. 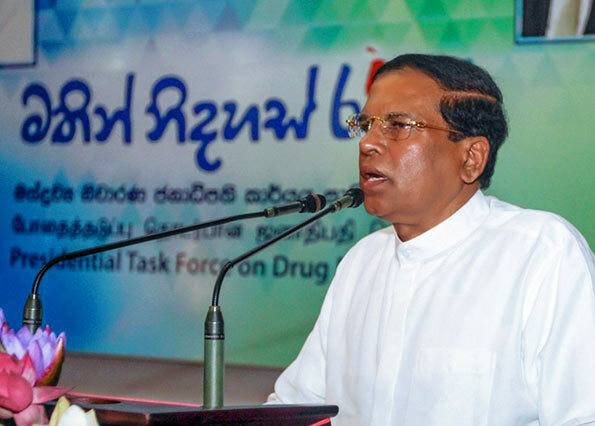 President Sirisena instructed to establish units on drug prevention at every government institution including ministries, departments and corporations. He pointed out the importance of giving the message of drug prevention not from bottom to top, but from top to bottom. The President recalled that the Presidential Task Force on Drug Prevention has already issued required circulars and instructions on drug prevention at district levels. He said the powers have been extended to District Secretariat Offices and Divisional Secretariats on that regard. “Everybody should get together to actively carry out this program”, the President further stated. Ministers Ranjith Siyambalapitiya, Kabir Hashim and the Chief Minister of Sabaragamuwa Province Maheepala Herath also participated in this occasion.